45 Day Guarantee and 99.9% Uptime Guarantee. For a 1 year basic shared hosting plan. HostGator was founded October 2002 in Florida and within 2 years they had over a thousand customers. By 2006 they had moved their office to a 25,000 square foot facility in Houston Texas. By 2009 HostGator had more than 200 thousand customers which prompted them in 2010 to expand their enterprise and move their 500 employees to a 100 thousand square foot building in Austin, Texas. Through all this HostGator has grown into one of the top providers today for shared, virtual private server, and dedicated hosting provider. This makes them ideal for hosting content management systems (CMS) of any size and scope like WordPress, Joomla, and Drupal. Today HostGator hosts over 9,000,000 domains (as of 2016) and has more than 850 employees to serve their customer needs. All hosting plans come with an industry leading 45 day money back guarantee and 24/7/365 customer support. HostGator also gives back by featuring climate friendly Green web hosting. HostGator purchases certified Renewable Energy Credits (REC's). This helps offset emissions related to their server farm power consumption with wind power certified credits. With all hosting packages you also get free website transfer(s), domain transfer(s), MySQL transfer(s), and cPanel transfer. Shared hosting plans get 1 transfer each with VPS and Dedicated hosting plans getting significantly more. cPanel transfers include all domains, subdomains, email accounts, and the rest of the cPanel settings. 24 by 7 by 365 Server Monitoring is also included along with automatic weekly off-site data backups. Whether your website is for personal or business use, one of your HostGators shared hosting plans will probably fit your needs. HostGator shared web servers runs on Linux, Apache, MySQL, and PHP, which means you can run all sorts of web sites from CMS's like WordPress and Joomla to e-commerce sites, forums and photo galleries (and everything in between). Each web server cames with the following programming languages CGI, Fast CGI, PHP 5, Ruby on Rails, Perl, and Python. The PHP modules installed include CPAN, Curl, ImageMagick, GD Library, and you are able to install others. You can also use the Secure Shell (SSH) to access your shared server directly. HostGator uses the cPanel Control Panel which gives you access to all the log managers and statistics you need. From here you can also create unlimited sub domains, custom error pages, schedule Cron Jobs, redirect URLs, access the IP Deny manager, password protect directories and use the web based file manager. You can also setup your FTP accounts and as many Email accounts you need. You can access the email via POP3 and SMTP, or via a WebMail solution (Horde, SquirrelMail, and RoundCuge). Via cPanel you can install with just one click over 75 open-source scripts. Databases are an important part of most modern websites. With HostGator shared hosting you get to create as many MySQL databases as you need and you can access them online via the popular phpMyAdmin. * Prices based on 1 year subscription which will renew at the regular price. Prices can increase/decrease depending on subscription length. All prices in USD unless specified other wise. Costs and features offered last checked February 12, 2016. Compared with shared hosting you can expect twice as fast load times with HostGator Cloud Hosting due to the multiple caching layers designed for speed, and premium hardware which is shared with less users. With the caching comes the added benefit of data mirroring. Your data is mirrored across 3 servers which gives you redundancy. If one of the servers ever has a hardware issue your web site will automatically be requested from one of the other servers. Cloud Hosting also includes an enhanced version of cPanel. When you login this gives you a dashboard which shows you information on the important metrics of your site performance. It allows for resource management and makes scaling resources easier by allowing you to add resources with a click of a button. There is no need to move your data to another server and there is no downtime. 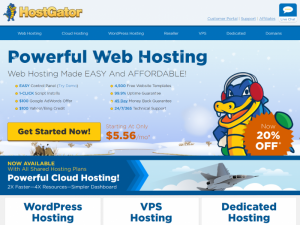 HostGator VPS hosting is customizable and can be upgraded as your website grows. As of 2016 all HostGator VPS servers utilize 32-Core AMD Opteron 6376 processors, 128GB of RAM, and 3.6TB of RAID 10 storage. There state of the art data centers comes with backup power generators and HVAC units along with a fully redundant network and a gigabit uplink with a guaranteed 20 MBIT connection. All VPS hosting packages (except Snappy 500) offer both Semi and Fully Managed options. Fully Managed comes with cPanel while Semi Managed allows you to use Virtuozzo to access your server and install and manage the software you want. HostGator VPS servers come with CentOS Linux with Full Root Access. Apache Web Server and MySQL are pre-installed along with PHP, Python, Perl and Ruby on Rails. Snappy 1000 and Snappy 4000 Virtual Private Server hosting plans are also available but are not shown in the above chart. 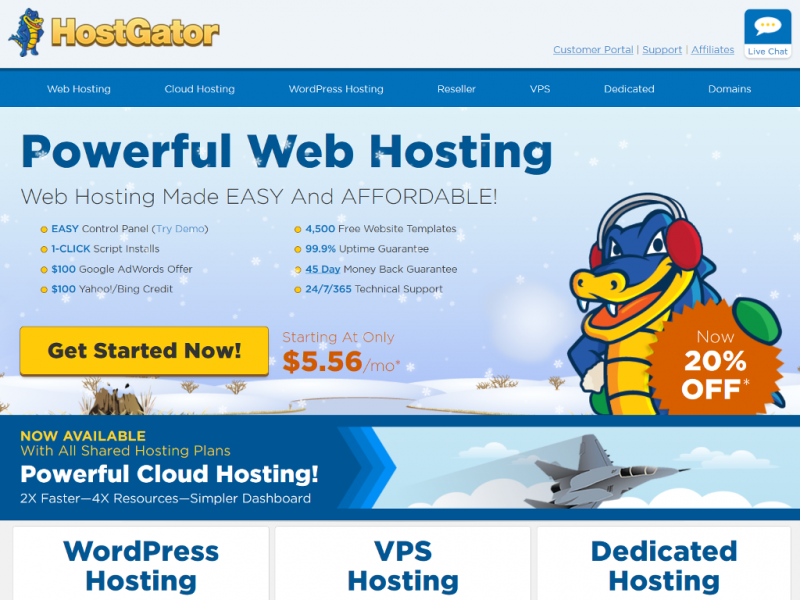 HostGator offers a fully managed Dedicated Server Hosting on both Linux and Windows servers. A dedicated server is designed for high traffic volume websites and large businesses. A dedicated server allows for maximum overall flexibility and has the server and network resources available to keep even the busiest website with fast response times. All Linux dedicated servers include CentOS Linux with full root access along with cPanel and WHM for total control over your server. Software already installed includes Apache Web Server, MySQL, PHP, Perl, plus a number of other programming languages. For securing your dedicated server, IPTables Firewall is also installed. All Windows dedicated servers include Windows Server 2012 R2 with Remote Desktop access. IIS Web Server along with MS SQL, MYSQL, FTP Server, and the Windows DNS server are also installed. Parallels Plesk Control Panel is included to give you quick web access to your websites statistics, IIS and the database software. Windows Firewall is used to secure your server. The below table includes HostGator Linux sale prices. Windows Server sale prices are on average $35 more per plan. Everything else in the table is the same for Linux and Windows servers. 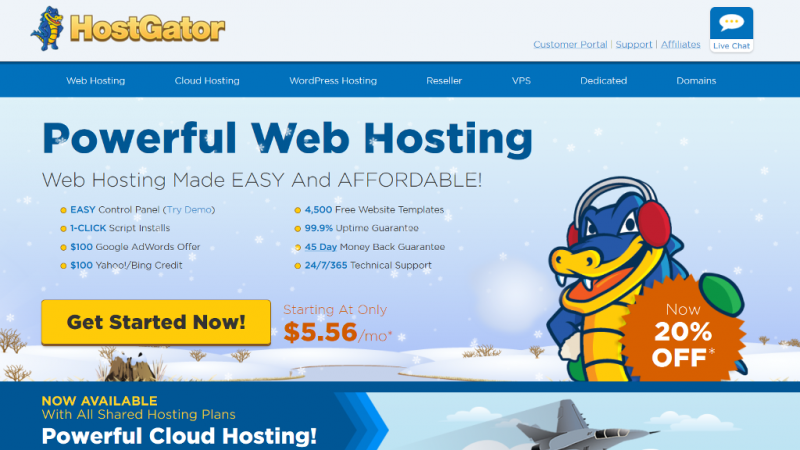 HostGator has a 45-day money back guarantee on shared and VPS hosting plans. If you are not satisfied with your service and it is before the 45 day guarantee just cancel your account. Once cancelled, reply to your cancelled confirmation email to inquire about the refund. HostGator also has a 99.9% Uptime guarantee for all shared and reseller web hosting accounts. If your shared or reseller server falls short of the 99.9% uptime guarantee, you may receive 1 month of credit for that package on your Hostgator account. Planned server maintenance does not count as downtime. As long as your server is available to deliver content, then it is considered up. The Uptime guarantee does not include programming issues you may be having with your website(s). Customer service at HostGator is available 24 hours a day, 7 days a week, and 365 days a year via phone (toll free), online chat, and email (via their ticket system). The Hostgator Support Portal contains an in-depth knowledge base of over 680 informative articles and 500 plus video tutorials on all aspects of the service they provide. The HostGator forum is also a good place to go to find information related to web hosting and to ask any questions you have not only to HostGator Customer Service but other HostGator customers. The type of web hosting service provided. The web site domain which was hosted by the service you are reviewing. Please do not include the sub-domain www or the protocol type (http:// or https://). Hosting has just gotten cheaper over the years. I've been using Hostgator for 5 years now and it's had it's ups and downs. For the most part the shared hosting plan I use has been good to me. Uptime has been really good and I have had only minor performance issues which was not related to my account but someone else on the server. Customer service over the years has gotten a little slower in their reply time but they still answer within a few hours if I need them (which hasn't been much in the last year). You can't go wrong using Hostgator if you are hosting a Wordpress site like mine that receives moderate traffic. I am happy with their VPS service. It is lightning fast speed. Have to wait a bit if you need to talk with customer service, they could speed that up. Overall I would recommend them as reliability is decent (beats GoDaddy hands down) and speed of hardware and their internet is really good... which is most important for SEO and Google love. I've had a pretty good experience with Host Gator for my local business website. It is using wordpress which I had a web developer work on to get the theme and graphics how I wanted. It is pretty fast and the deal I got was good as I found a coupon code. Worth every penny. I found it is also good to have a Facebook page setup for your business as well. I've used several different web hosts over the years and last year I switch to Host Gator after problems with my other host. My WordPress websites have had great uptime with Host Gator and no real performance issues. Sending and receiving emails has been good and I've had no problems sending large volumes of emails for my newsletters using Host Papa email servers just as long as you space out the delivery time for them. When I first setup my account at Host Gator I did have a few issues. Nothing major but tech support did take a few days to get back to me via email. Definitely not idea but I was able to work around the problem until then. If I have a major problem next time I will be more forceful with tech support because they should be answering within minutes/hours instead of days. For the first 8 months I haven't had any problems with Hostgator but recently that has change. I am nut sure if they have added more customers onto a single shared server or it is the same and some customer is hogging all the resources which Hostgator has not spot. During the last week I found my website for 6 hours was completely offline. I had no warning from customer servers and the only reason I know about this was due to my website monitoring service I had setup months earlier. I plan on sending Hostgator customer service a message on this to see what they say. They do have a uptime guarantee which I plan on requesting. I will report back to let you know if they will honor it.